MONROVIA – The Liberian Senate has requested that the five-year fishery deal between the Government of Liberia and Senegal be brought to the legislature for ratification, but the National Fisheries boss is disappointed over the ideal, threatening to abandon the agreement. “We will just forget this deal. We go outside and try to look for investors and people try to do all kind of things with it,” she slammed. Madam Glassco appeared before the Senate on Tuesday to keep the Senators abreast with factual information relating to the deal. She told the Senate Maritime Committee that the agreement between the two countries is a cooperation frame work that has not met international protocol which would require the signatures of the Finance, Justice and Foreign Affairs Ministers. 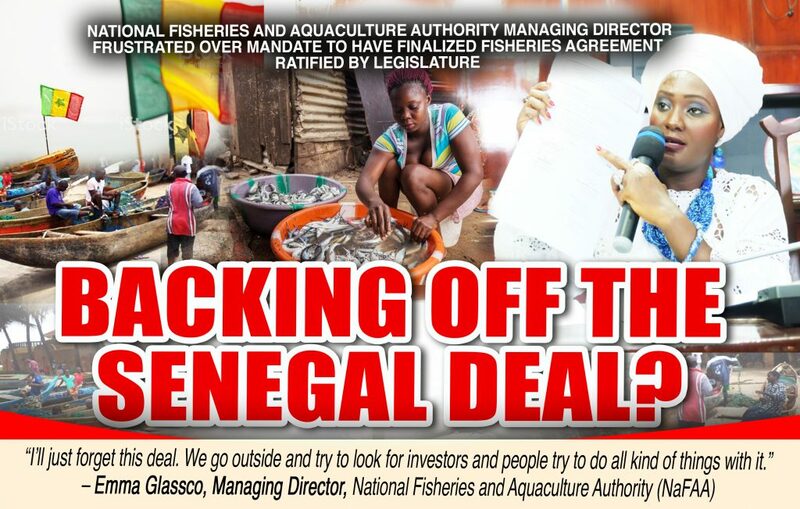 The fisheries boss said the agreement is a diplomatic guarantee between Liberia and Senegal which assures security for Senegalese investors who may express interest to invest the sector. “The deal has no national obligation, no tax break and no economic incentive. It’s just a frame work,” she said. According to her, as per the agreement, should Senegalese investors choose to come to Liberia, Liberia would benefit up to US$10 million in revenue collection from licensing fees and royalties. She disclosed that the Senegalese would not be allowed to exceed 300 canoes over the five-year period. She admitted to Senator Henrique Tokpah (Bong County, Ind.) 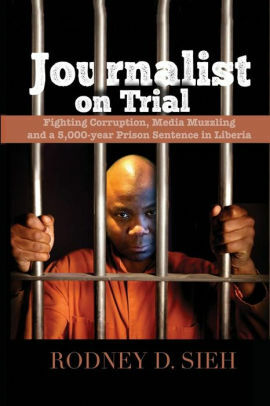 about Liberia’s inability to monitor companies fishing on Liberia’s territorial waters. She noted that Liberia remains vulnerable as a USAID report shows that Liberia loses close to US$75 million annually to illegal fishing. In a related development, prior to going to the Senate, Ms. Glassco and her deputy Director for administration, Augustine Manoballah, visited the fishing peninsula of West Point to alleviate the fears of fishermen and fish mongers there over the deal with Senegal. “There is no secret about this; we just want to dispel this rumors that we are trying to play with the artisanal fishermen. For somebody to say we are going to sell all of the fishes in the water, it just shows that you are ignorant to the sector, we are talking scientific issue and not politics, so it is not possible to sell all the fish from your water,” Manoballah explained. The fishermen expressed dissatisfaction over not being consulted before consummating the deal. Manoballah, however, said it is not a best practice to discuss an agreement before it is signed. He said, the consultation with locals on the ground comes about when the agreement reaches the implementation stage. Theresa S. Bayon, Secretary General for Liberia Artisanal Fishing Authority, told FrontPage Africa that the explanation provided by the fisheries authority was not satisfactory. We are not stopping National Fisheries and Aquaculture Authority, NaFAA from bringing 60 industrial boats that will be fishing in the 200 nautical miles, but what we have problems with are the boats coming into our six nautical miles called the semi- industrial boats that would be operating in four nautical miles. So, it is still in our pepper bush and we do not want it there,” Theresa said. Jerry N. Blamo, Acting President for the Artisanal Fishermen Association, said NaFFA officials are not fishermen and they do not go with fishermen on sea to know the kind of fishing they are doing, neither the type of method they are using and the destruction they carry on. The agreement allocated 300 fishing licenses (in its own water) to Senegalese fishermen for five years. Of the 300 licenses, 200 would be given to artisanal fishing and 100 for semi-industrial fishing. In exchange Senegalese will give pieces of advice to Liberia to fight against illegal fishing. The five-year agreement which is also renewable for equal period will grant Senegal green light to the exploitation and the management of the marine resources, the enhancement and commercialization of fishery and aquaculture products, fisheries research, preservation of the marine and coastal environment, training and capacity building of human resources, monitoring, control and surveillance of fisheries and safety at sea for artisanal fishermen, among other important measures in Liberia. Senegalese fishing boats on Liberian waters would not exceed 100 boats a year. Fishes caught by artisanal boats would be supplied to Liberia only. Artisanal boats from Senegal will be charged a flat rate of US$1,000.00 per boat per year. Semi-Industrial fishing boats, which are largely operated by foreign fishermen would be charged a flat rate of US$1,500.00 per year. Boats of this categories are restricted to fish from the 4 nautical miles zone and above of our territorial seas. Semi-Industrial boats under this agreement are not forced to land their fish catch in Liberia.